Sightseeing as a tourist while travelling through Scandinavia, I admired and marveled at the interior designs and different colour schemes. 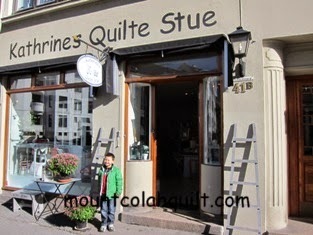 In Oslo, on our way to the playground at Vigelandsparken Sculpture Park, my Sunshine and I visited a patchwork shop, Kathrines Quilte Stue. While there, I have learnt to be more appreciative of 'muted' colours. I probably bough these fabrics in 'French General' range by Moda soon after my return from the trip. I was attracted to their quiet and pleasant colours. 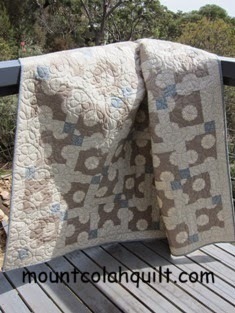 With a simple patchwork pattern, this 'muted' quilt was made. I chose the quilting pattern named 'am-gingerflower' by Apricot Moon Design for the quilt and I'm very happy with the result. 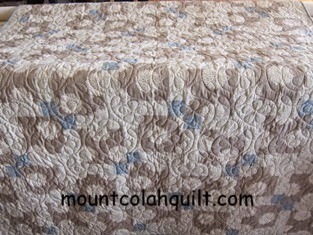 It took me longer than expected to complete the quilt as my (still) wonderful Gammill Statler took a break half way through the quilting. 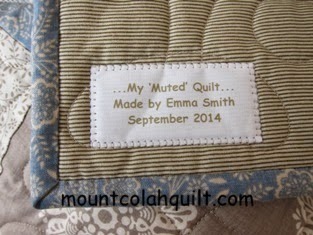 Early morning chat to Gammill in the US identified that the quilting machine needed a new Galil board, and was subsequently serviced before I was able to continue the quilting and eventually finish off the quilt. 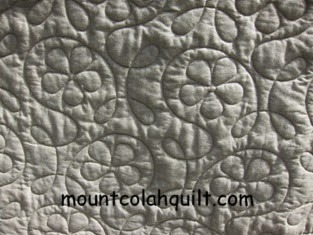 Creative Studio software has made it possible for me to pick up the quilting where it was left off, and I have no complaint - I'm very happy about it, actually.